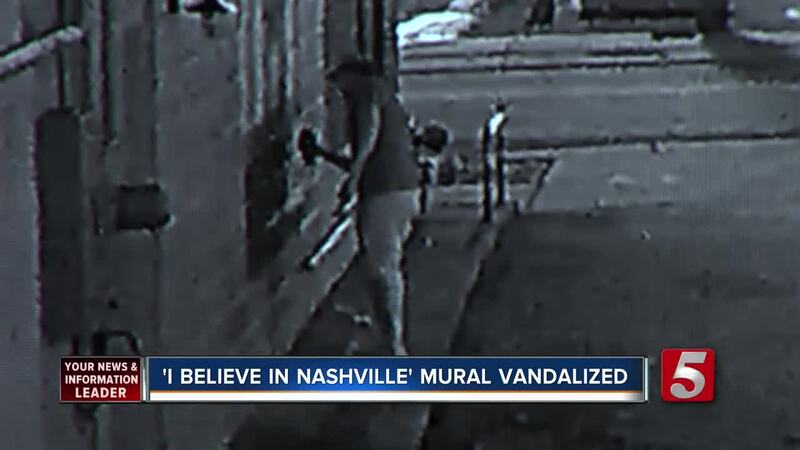 Caught on camera, one of Nashville's most famous spots for a photo-op has been vandalized. The "I believe in Nashville" mural in 12 South was defaced again. Just after 3 a.m. Saturday, a man on a bicycle began vandalizing the I Believe in Nashville mural in 12 South. In the surveillance video, you can see that the vandal came prepared with spray paint. This isn't the first time this has happened, this is the third time the Nashville section of the mural has been painted over. The mural is located in a popular area where tourists stop to take pictures. Nikki Cook came to Nashville for her bachelorette weekend. The group planned on stopping in 12 South to take a picture in front of the mural. That's when they learned it was defaced. It put a bit of a damper on the day, but the group didn't let the graffiti stop them from taking a photo. "We did [take a photo], but we blocked the graffiti! We all got in front of it so we could still have the idea, but not draw attention to the fact that somebody wrote over it," said Cook. The artist of the popular tourist stop came up with the idea for the mural after the Nashville floods. He received a phone call to come repair it Saturday morning. That call was one of many he has received to come out to repaint it. They planned to have the mural repainted by the end of Saturday weather permitting.